Boden got almost all my knitwear budget this year because I am sick of inferior quality at any price point. So far, Boden has not let me down, and I can rely on them for good fit and colour too. My loyalty lies with them for knitwear for the moment. (And Topshop, and 1901 too). I've seen lots of cashmere hoodies over the years - something my clients really like - and this is the BEST by far. The drape, fabric, fit and feel is divine. Relaxed by adequately structured. Not too long and sloppy. POLISHED and very crisp. The hood does not ride back on the neck. Dressiest cashmere hoodie I've seen - if that makes sense. It's pricey, unfortunately. I committed to the stripe and I don't even like grey - THAT'S how sublime this is. But I adore the colourful stripe and quality. It looks gorgeous worn under my navy polka dot blazer. Good with the new jeans, white Western shooties, and light blue Furla. A nod to Sporty Luxe. I'm excited, and will wear this soon. Maybe tomorrow, when I work with a client. That sounds like a great outfit! I like the hoodie under blazer look although I've never had quite the right pieces to do it myself. A very nice hoodie! And a glorious outfit. I'm a little picky about how I wear grey, but I always like it with red. And who can argue with a stripes-and-dots pattern mix?! You are killing me! It has red stripes...I'm supposed to be looking at mustard yellow stuff! I’m into this look in a big way. 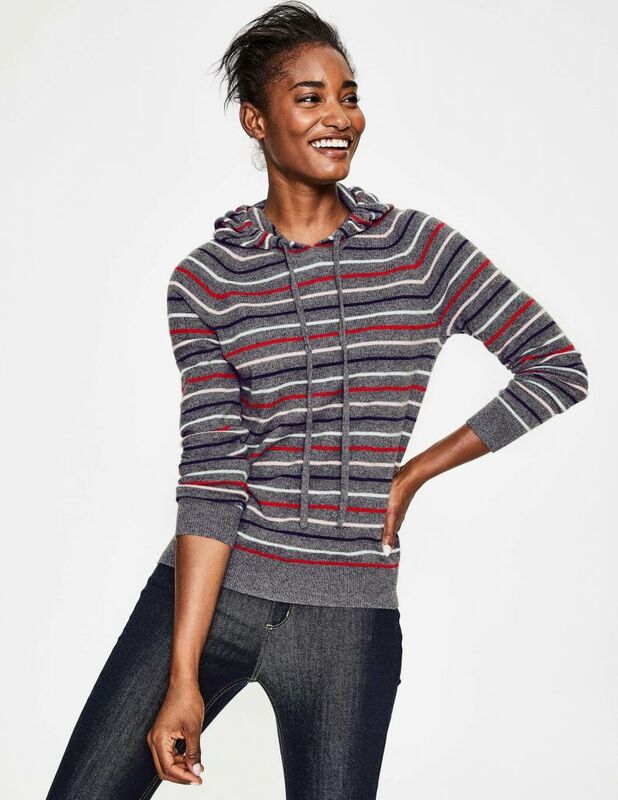 I have two knit hoodies in rotation right now but love the idea of a stripe . Geez Boden is pricey in Cdn $ . I can just imagine this outfit on you - can you post a quick pic for us ?? I saw this in the catalog, and immediately loved it. Very, very tempting..though I need to stick with other priorities for my clothing budget right now. But, if it happens to still be available in December, I know what my boys are getting me for Christmas. Thanks for the review! I may be saved if it runs a little short as these welts ride up to my waist. But I’m confused on the colors- in one pic the stripes include pink and blue and in another just the red white and black. What a fantastic outfit and nice pattern mix. Still getting my head around you in in a (admittedly luxe) hoodie. Gorgeous hoodie. I love the sound of your outfit Angie. I might wear my brown cashmere hoodie with my brown leather blazer today. That striped hoodie is super cute! I love your pattern mixing. OK - I have the Boden blazer and white boots - so I need some fab jeans, this hoodie and a light blue bag...I love this outfit. The light blue and pink in the hoodie keeps the grey looking crisp. The grey background seems to disappear and really makes the colorful stripes pop to my eye. Luxurious and fun, enjoy! Quick question about scratchiness..are you finding that the striped cashmere sweaters from Boden are better quality than the solids? In your post about Boden fit, you’d noted that a Boden cashmere crew neck went back because it was scratchy. But, the stripe was a top pick. And, there is a pretty big price difference, so I was wondering if there might be a quality difference as well. Oh Angie. What are you doing wearing hoodies? Where did our resident Dressy Lady go? Love the gray stripes! I wish they did petites in sweaters. I still haven't taken the plunge with Boden......having to mail back returns from Canada gives me pause. I'll see if I can snap some pics later, Lisa p. I thought of you when I put together this Sporty Luxe combination. Smittie and Shevia, in my defense, it's a luxe hoodie under a dressy blazer - am I off the hook? Kathie, I've found that some of the Boden cashmere is itchy this season, and some is not. This is fine. So far. Collette, YES. The grey dissappears because of the stripe. Good thing! Unfrumped, the stripes are pale pink, light blue, red and navy. No black. Suz and RunCarla, SOOO your vibe and palette. Bijou, I want to see your outfit. Inge, would you wear a cashmere hoodie? The stripe is perfect! La Ped, I know, right? Happy pattern mix. Marilyn, TAKE THE PLUNGE. And you can get some Boden at Nordies. I think since this has a blazer, white booties and structured bag, this hits your marks for polished. But it seems like a playful look, with the hoodie and trendy jeans. NICE. Boden is offering 25% off starting on Sunday ... just saying. Ok, I see now, in one photo the pink and blue are faded out until I zoom in, so it looked different! Please do not get the matching joggers. I agree w Lisa P! You had a hoodie, blazer combo some years ago. Youll have to link it for Smittie!